Multiattack. The brahmiluff makes two bite attacks. Bite. Melee weapon attack: +6 to hit, reach 5 ft., one target. Hit: 9 (2d4 + 4) piercing damage. Trample. Melee weapon attack: +6 to hit, reach 5 ft., one target. Hit: 11 (2d6 + 4) bludgeoning damage. Primal Fury. 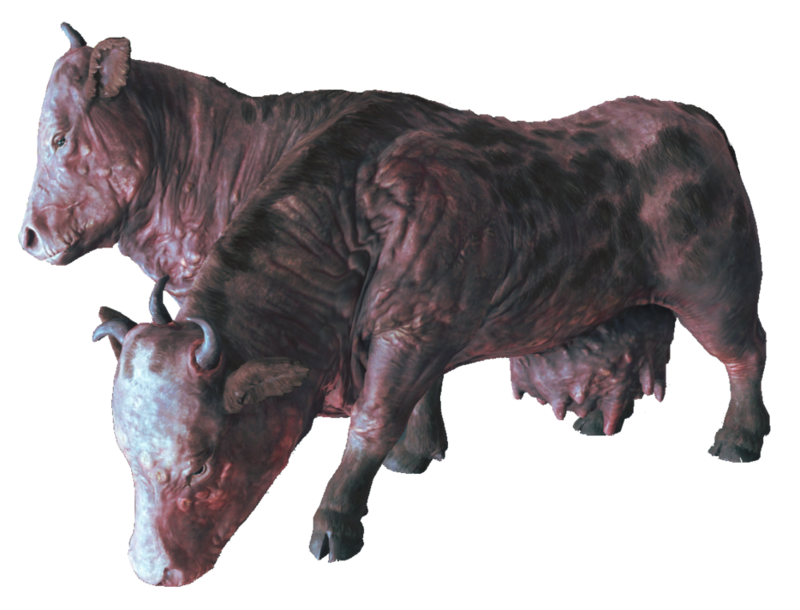 The mad brahmin has advantage on Strength checks and Strength saving throws, and adds +2 to its melee damage rolls (already included in its attacks). Multiattack. The brahmiluff makes two bite attacks and a trample attack. Bite. Melee weapon attack: +6 to hit, reach 5 ft., one target. Hit: 11 (2d4 + 6) piercing damage. Trample. Melee weapon attack: +6 to hit, reach 5 ft., one target. Hit: 13 (2d6 + 6) bludgeoning damage.